Alsace has 26 Michelin-starred restaurants, some of which have more than one, and there’s a good reason for that. They have the advantage of being on the main border from François to Allemagne- that means Germany. I just Googled it- meaning Alsatian food has an incredible mix of culture when it comes to their plates. While the title suggests you may get a plain, written answer, I’m instead just going to say what Alsace has to offer and hope that the answer becomes obvious to you when you see it. Alsace isn’t selfish with what it produces and cooks, so their dishes are often shared in neighbouring regions, but the Germanic influence gives it some fruity names that add a splash of independence. A simple yet addictive dish born in Alsace. i am a food blog described the dish in the perfectly simple way of ‘basically a pizza topped with crème fraîche, thinly sliced onions and lardon,’ and the blog post & recipe shows a great example of how adaptable it is. 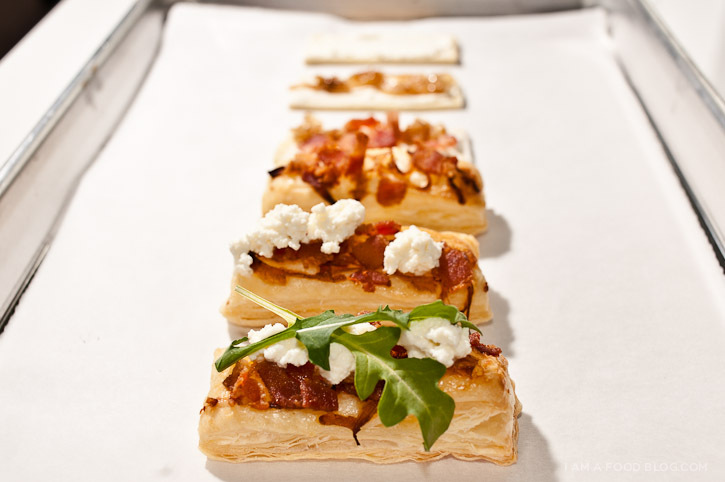 This version has ricotta cheese, rocket, puff pastry, and I want it. Like Sauerkraut but with a Franced-up name. 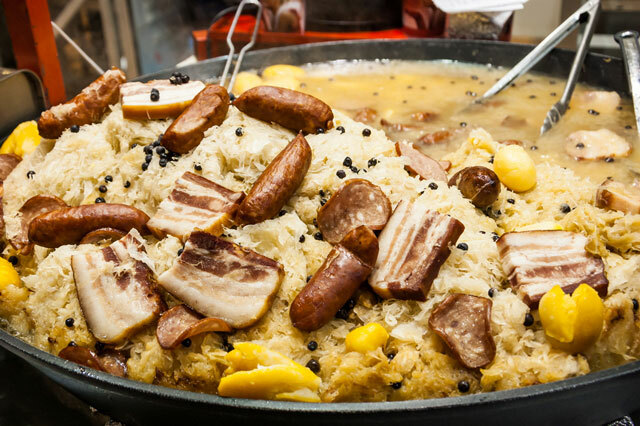 if you’re not already familiar with the meal I’d firstly ask how you get internet in the airless voide you’ve clearly been living in thus far before explaining that sauerkraut translates to sour cabbage (salted, junipered and fermented) and served with pork or sausage. 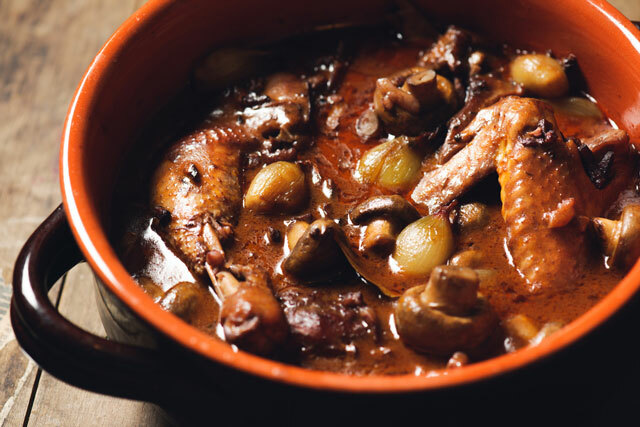 Coq au vin, which is braised rooster with wine, lardons, mushrooms and, if you want to be extra French- which of course you do- tonnes of garlic. Despite the dish not sounding too outlandish, I’ve never tried coq au vin or reisling, so please share your culinary experiences. Beer is produced in and around Strasburg at an impressive rate, in fact, it produces the most beer in France: yet another notch in Alsatian achievement. The two big names in the city are Heineken International- which is one of many- but also Kronenbourg, of which Strasburg has always been its home. Brewing has been moved from the original site, but you can still visit ‘Brasseries Kronenbourg’ throughout the year. Well worth a visit if you’re interested in hop history. Foie gras is part of Alsatian industry but not as big as Dordogne, which is responsible for 80% of foie gras production, but we’ll get to that in April when we visit Dordogne itself. Alsace has one of the best locations for culturally-diverse food. You don’t need to be a geographer to work it out. It’s the biggest border between France and Germany, yet, despite being divided by the Rhine river, has many towns and cities such as Freiburg along the border that are split down the middle. This forces an active mix of borders that seems hard to comprehend as a UK resident. I couldn’t call which side I’d prefer to live on, and this isn’t a post on politics, but a few days on the river should help the decision-making process. No one would dare rank these eateries, so instead they’re shown by town or city. If you think one deserves a particular mention, let us know. We won’t be adding links to all these, because someone else has already done so, here are the links to all the Michelin restaurants in Alsace.